Blending 20 years of ergonomic expertise with the latest in reliable wireless charging technology, the award-winning SmartFit Laptop Riser with Qi Wireless Phone Charging Pad is the ideal partner for the newly-announced iPhone X, iPhone 8, and iPhone 8 Plus. 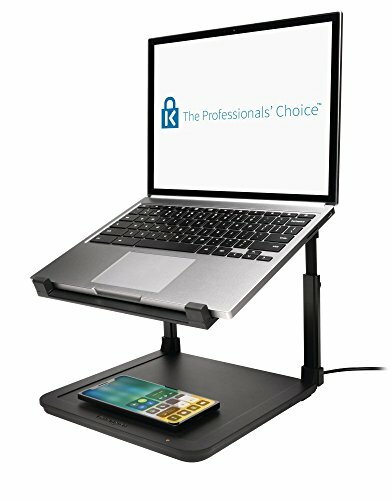 Lift your laptop up to eye level to relieve neck and back strain, then use the lower platform to wirelessly charge your phone. The SmartFit system allows you to find your personal comfort color and self-fit the riser to your ideal height. It also utilizes Zero Footprint mounting so you can mount any compatible Kensington universal dock underneath the laptop platform, keeping your desktop less cluttered. Compatible with laptops up to 15.6" and 7.7 lbs.